Ross Williams was part of a small Western Australian company that designed software for the Exidy Sorcerer. After developing Grotnik Wars for the Sorcerer, Williams later ported Grotnik Wars to the Microbee, and started his own company, notably named Grotnik Software. 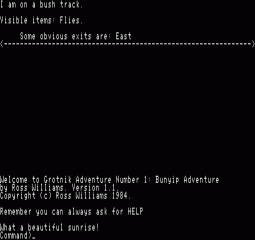 Grotnik Software produced a number of games for the Microbee, including Bunyip Adventure (1984), Grotnik Wars(????) and Link (1985). This is it! A breathtaking 3 dimensional simulation arcade game. We wanted to call it Dynasty, but Ross is determined that a game with a difference should have a name with a difference! It’s a video arcade game that isn’t coin hungry. You, as commander of a star ship, must search out and destroy enemy spaceships in 8 galaxies. Of course, you have only a certain amount of energy, and when you fight an enemy ship that is in your galaxy, it may fight back and damage your ship. The many innovations in GROTNIK WARS make you feel that you are actually piloting the spaceship instead of just hitting keys, but the feature that gives it life is its real time animation. As you patrol a galaxy, you see a field of meteors passing you, just as if you were moving through 3 dimensional space. Asteroids appear out of the distance and grow larger as they near you, before drifting past. When you steer the ship, the stars outside veer realistically in the opposite direction. Enemy ships appear from above, below or from the side, receding in size as they speed past. But the hyperspace effect (used to move you to a different part of your galaxy) and explosions must be seen to be believed. ‘ Never before has there been anything like it for the Sorcerer! “cassette $19.95.